Some people hop through the day with ease, for others, just staying awake is a struggle. As the years go by, people often find it tough to get through the day without innumerable cups of coffee or cigarettes. There is no doubt that stress and fatigue are closely related; when one increases, the other does too. Says Ritika Samaddar, head of department, dietetics, Max Super Speciality Hospital, New Delhi, “Corporate life is mostly very stressed out; this is a result of a combination of tension, low activity levels on a desk-bound job, and consumption of a large quantity of food, which is usually poor in quality." Know how you feel refreshed after a wholewheat roti? It’s got nothing to do with a full stomach, it’s all about how complex carbohydrates like wholewheat, oats, corn meal and brown rice go though the digestion process. While all types of carbs provide energy, complex carbs take a bit longer to be digested, broken down and absorbed into the body. This means they provide energy at a slow and steady rate over a longer period of time. The longer digestion time also accounts for the feeling of fullness. This means that once you eat a hearty breakfast comprising these types of carbs you will feel hungry only around lunchtime, with no snacks in between. The next time you’re tired, reach for a glass of water instead of a cup of coffee. Sounds simple enough, but it’s not always easy to follow. Our experts say that while people should drink at least eight to 12 glasses of water in a day, the reality is that most end up drinking not more than four-five glasses. Add to this the habit of consuming endless teas, coffees and colas, which can be dehydrating, and your body is crying out with thirst. Dehydration is one of the main causes of mental and physical fatigue, considering that 60-70% of our body is made up of water. What’s more, water is required to digest food properly. Adequate levels of water in the body help increase circulation, which in turn increases oxygen levels, thereby improving energy levels. 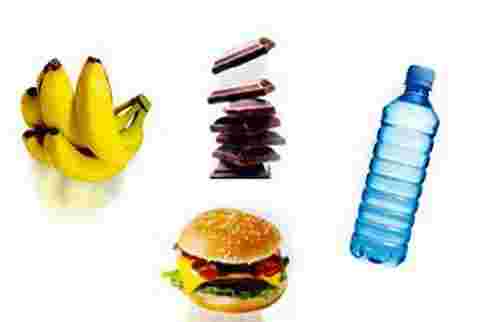 The ubiquitous fruit in gymnasiums around the world, a banana a day perhaps keeps tiredness away. If you’re not diabetic, bananas are a great fruit to consume regularly for energy. They contain three different types of natural sugars and fibre and this makes the banana a complex carb with a difference. It gives both an instant boost, owing to the natural sugars, and sustained energy, owing to the fibre. Because of this instant-energy boost, our experts suggest banana is a perfect morning fruit. One banana contains approximately 100kcal, which is equal to a roti. Antioxidants found in fruit and vegetables, green tea, some spices and even dark chocolate are wonderful aids in fighting fatigue. Research has shown that low energy levels are closely related to low immunity levels, which make you more prone to disease, thereby making your body weak. Antioxidant-rich foods, then, play a role in enhancing the body’s immunity by scavenging free radicals that bring down immunity. In a pilot study conducted by the Hull York Medical School in 2007 among sufferers of chronic fatigue syndrome, patients were divided into two groups—one group received a daily 45g dose of dark chocolate, and the other was given white chocolate dyed to look like dark chocolate, for two months. Eventually, it was found that those taking real dark chocolate had significantly less fatigue. Even curcumin, an antioxidant found in turmeric, has been shown to reduce physical exhaustion in mice because of its anti-inflammatory effects. So load up on your greens, beans, green tea, chocolate and a small amount of red wine, all of which contain antioxidants that help reduce tiredness. We all know that exercise is good for health, but some stay away from it fearing that exercise stress may add to fatigue. This could not be further from the truth. According to the American Academy of Health and Fitness, in a study published in the Psychological Bulletin in 2006, researchers analysed 70 studies on exercise and fatigue involving more than 6,800 people. More than 90% of the studies showed the same thing—that sedentary people who started a regular exercise programme reported improved fatigue levels. This means that not only does exercise help fight chronic health conditions, it also increases energy. This shows that exercise slowly builds stamina and injects a flow of hormones that help one feel lighter and cheerful. You’re famished and are looking forward to a heavy meal that will help you fuel up for the rest of the afternoon. But the opposite usually happens—you are slumped over with sleep and struggling to keep up with work. This is because heavy meals take up a lot of energy to get digested. So instead of ordering a chana-bhatura, opt for something light like an idli-sambhar and a glass of light chaach (buttermilk). The energy provided by these foods will not be spent in an arduous digestion process and you will be fuelled up for the rest of the day. Other light meals include stir-fried chicken or fish and vegetables with roti or brown rice, a light vegetable sandwich or sushi. Experts also suggest eating six light meals in a day instead of three heavy meals so that you get a constant supply of energy. Your favourite burger or pizza is a combination of excess salts, refined sugars and simple carbohydrates. While junk food may taste great and provide instant energy, this boost is usually shortlived. Refined carbs turn quickly into sugar, which is responsible for increased energy, but since this process happens much faster than complex carbs, this energy burns out quickly, leading to a slump a short while later. Similarly, sugary foods increase blood sugar levels to more than normal, thereby releasing insulin. The insulin triggers tryptophan, a kind of amino acid which gets converted into serotonin (a neurotransmitter) in your brain, making you feel sleepy. Nothing enhances energy levels more than a good night’s sleep. While rest and relaxation work to rejuvenate, a sedentary lifestyle works to increase fatigue. A desk job is sedentary. When your body gets used to sitting for long periods, even the smallest exertion can leave you breathless. It’s now proven that exercise fights stress. Sedentary lifestyles increase boredom and leave no room for expulsion of this stress that usually leads to low energy levels. Routine works well for everyone but when all you do is follow the same routine day after day it leads to boredom. And this in turn can lead to a lack of motivation and depression that robs you of mental and physical energy. There is no energy without drive and you have to keep feeding it with new activities on a regular basis. That said, if you experience low energy levels with a feeling of sadness for more than two weeks, get yourself checked for a depressive disorder. Breakfast is the most important meal of the day. Not least because it is at least 10-12 hours after your last meal. Skipping breakfast leads to low blood sugar and, therefore, low energy. A cup of sugary tea may rejuvenate you temporarily but it’s shortlived. In a study published in 2005 in the Journal of the American Dietetic Association, it was found that children who ate breakfast were less likely to be overweight, with improved cognitive function related to memory, grades and attendance. Take our advice, don’t miss breakfast.